The Rapid Response Section contains articles, reports, press releases and tools that support local collaboration regarding current immigrant issues. All of these links and much more can also be found in the Resources Search page. Resources for Refugees Facing Deportation to Cambodia, Vietnam, and Laos. Immigration and Customs Enforcement (ICE) has carried out a series of devastating raids on Southeast Asian refugee communities. This website was created by non-profit and community organizations to provide resources and up to date information to people facing deportation to Cambodia, Laos, and Vietnam. 5/18 This fact sheet from the American Immigration Council, provides an overview of the U.S. citizen children who could be impacted by immigration enforcement actions, the challenges and risk factors that these children face, and the existing mechanisms designed to protect children if a parent is detained or deported. 7/16/18 Now that the Contra Costa County Sheriff's Office has ended its jail contract with U.S. Immigration and Customs Enforcement, activists who pressured officials to end the partnership are calling on them to release the 169 detainees at the West County Detention Facility before they're transferred out of the region. Civil rights activists from across the Bay Area (concerned that many detainees may be jailed in facilities far away from their families and lawyers) are calling on ICE to speed up their cases and to release eligible detainees on bond. But whether ICE will clear their cases seems unlikely. 9/12/18 Anti-immigrant hate group Federation for American Immigration Reform (FAIR) held their annual media event, “Hold Their Feet to the Fire,” in Washington, D.C., September 5 and 6. The convening regularly brings together radio hosts, nativist hate groups and politicians. Among the attendees was Ronald Vitiello, the acting director of U.S. Immigration and Customs Enforcement (ICE). On September 5, as highlighted by America’s Voice and promoted by FAIR, radio host Tom Roten interviewed Vitiello. 7/20/18 Every year, millions of people wait for Congress to advance a solution that would provide stability for undocumented persons and their families. The numbers left waiting and worrying without a pathway to citizenship, protection from deportation, or the ability to work under the Trump Administration has only increased with the limitations on the Deferred Action for Childhood Arrivals (DACA) program and the termination of Temporary Protected Status (TPS) for certain countries. Without a solution, many are left with questions about how they can survive, resist, and thrive as an undocumented person in the US. If you are undocumented, this guide will help you answer some of those questions by informing you of your continuing rights, benefits, and obligations while you wait for federal legislation. An initiative of the Mexican government, to provide Mexicans who have voluntarily and involuntarily returned to Mexico with comprehensive care, through an inter-institutional and coordinated model to assist with short term to their social integration. Spanish Un Iniciativa del INM que tiene como objetivo brindar a los mexicanos que han retornado voluntaria e involuntariamente una atención integral, a través de un modelo interinstitucional y coordinado que contribuyan en el corto plazo a su integración social. 4/19/18 The April 17 SCOTUS decision Sessions v. Dimaya strikes down part of the Immigration and Nationality Act that authorized the government to deport some immigrants, including lawful permanent residents, convicted of “aggravated felonies.” The Supreme Court took up the issue of whether the term “crime of violence” in immigration cases is unconstitutionally vague. The void-for-vagueness doctrine protects people from being punished or deported based on vague language. The language of the “crime of violence” provision, for example, turned on an assessment of what is “substantial risk” of physical force. The Court held that this language was so vague as to be unconstitutional. Use this page to locate a detainee who is currently in ICE custody. Cannot look for records of persons under the age of 18. Search by A-Number or Biographical Information. 1/4/19 Federal immigration officials were barred Thursday from conducting any more unannounced raids on Cambodian immigrants living in the US with deportation orders, dealing a blow to the Trump administration, which has significantly stepped up deportations of Southeast Asian immigrants. Deportations from the US to Cambodia increased by 279% in 2018 compared to the previous year. In December, US Immigration and Customs Enforcement conducted its largest deportation flight of Cambodian nationals with 36 people onboard. Alternative identification cards can enable immigrants to enjoy great benefits other residents also enjoy and they can help facilitate their abilities to cooperate with local law enforcement in resolving crimes and other safety concerns. Description of various types of ID available and accepted in different cities and states. Provided by the Catholic Legal Immigration Network. 3/26/18 ICE, the federal agency tasked with Trump's program of mass deportation, uses backend Facebook data to locate and track suspects, according to a string of emails and documents obtained by The Intercept through a public records request. The hunt for one particular suspect provides a rare window into how ICE agents use social media and powerful data analytics tools to find targets. 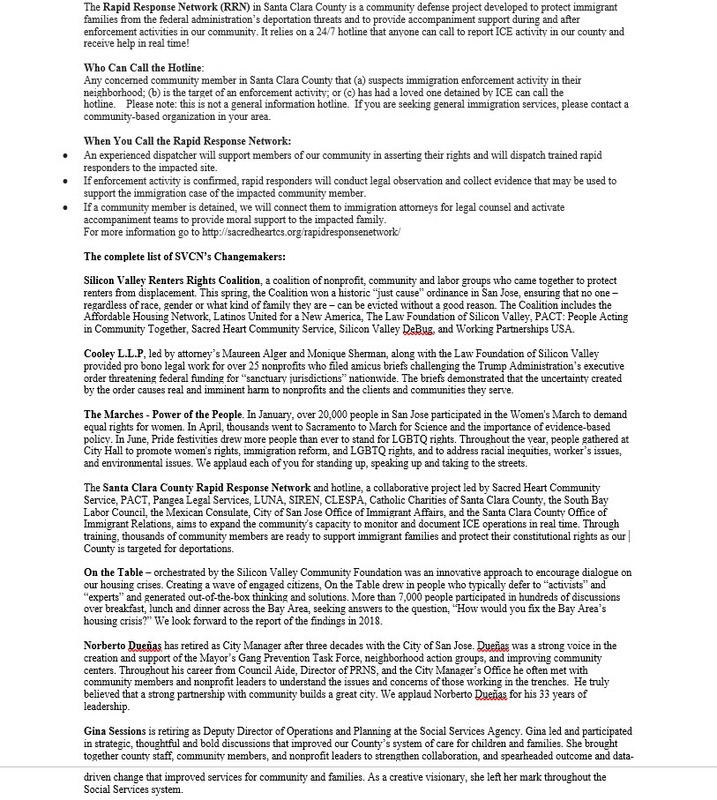 2/4/18 Less than two years after its inception, the Rapid Response Network of Santa Clara County has amassed a remarkable 700 volunteers - from longtime organizers and faith leaders to grandparents, stockbrokers and stock boys, saleswomen and software engineers - ready to respond to reports of ICE sightings with notebooks and recording devices in hand. Many of the Rapid Responders, like the Lynches, are white U.S. citizens - not directly impacted by the immigration debate - but desperate to find some way to do more than stand by. 2 ASL videos from DCARA (Deaf Counseling Advocacy & Referral Agency) with transcripts in English and Spanish: (1) If You Are An Immigrant Here Are 9 Things You Should Know. (2) Know Your Rights When ICE/Police Approaches You. 3/18 This new report: 1) outlines the constitutional and legal framework governing ICE's detainer requests to law enforcement agencies to engage in arrests and detention for civil immigration purposes; 2) places ICE's recent and current detainer practices in historical context; 3) outlines the legally defective ways this and previous administrations have attempted to package these practices, and 4) discusses the non-legal consequences of local law enforcement officers acting as immigration agents. Prepared by collaboration of: National Immigration Law Center, Southern Poverty Law Center, American Immigration Council, American Immigration Lawyers Assoc, and the Nat. Immigrant Justice Center. 12/15/17 Immigrant families....are living with heightened fear and uncertainty because of stricter immigration policies and increased enforcement under the Trump administration, according to a report released Wednesday by the Kaiser Family Foundation. The fear, and the stress it creates, is compromising children's health, possibly for the long term, the report said. It is also causing some parents to forgo health care or withdraw from public health programs such as Medicaid, which covers people with low incomes, and Women, Infants and Children, which provides nutritional assistance. 3/10/17 Te U.S. government reported a 5-fold increase in the number of electronic media searches at the border in a single year, from 4,764 in 2015 to 23,877 in 2016. Every one of those searches was a potential privacy violation. Our lives are minutely documented on the phones and laptops we carry, and in the cloud. Our devices carry records of private conversations, family photos, medical documents, banking information, information about what websites we visit, and much more. Moreover, people in many professions, such as lawyers and journalists, have a heightened need to keep their electronic information confidential. How can travelers keep their digital data safe? 3/27/18 The Santa Clara County Sheriff's Office allowed federal deportation officers to enter the jail it operates and interview four inmates this month in violation of the agency's pro-immigrant sanctuary policies, officials said. The interviews occurred March 7 and 8, around the time that U.S. Immigration and Customs Enforcement officers visited San Francisco County Jail and interviewed an inmate there in a breach of the city's sanctuary rules, which restrict local cooperation in deportation efforts. Santa Clara County Sheriff Laurie Smith, in a statement to The Chronicle, said members of her staff 'mistakenly' let ICE officers into the jail. After learning of the incident, she said, the office "reevaluated and strengthened the clearance procedures in which all law enforcement agencies are permitted to enter our facilities." 2/25/17 Report from the American Immigration Council - Over the past several decades, many states, counties, and cities have adopted a variety of policies intended to serve and protect all of their residents, regardless of immigration status. These laws, policies, or resolutions are sometimes referred to as "sanctuary" policies, although no legal or standard definition of the term exists. There are many reasons jurisdictions adopt "sanctuary" policies, such as: strengthening resident-police relations and ensuring that all people feel comfortable reporting crimes, regardless of immigration status; and protecting police agencies from liabilities resulting from local enforcement of federal immigration laws. Santa Clara County is strengthening the Rapid Response Network. Call the Hotline call for immediate support if ICE comes to your home, workplace or neighborhood, or to report a raid. Call (408) 290-1144. To find upcoming trainings or register as a volunteer with the SCC Rapid Response Network Click Here. This is a collaborative project led by Sacred Heart Community Service, Pangea Legal Services, PACT, SOMOS Mayfair, LUNA, SIREN, South Bay Labor Council, CARAS/SEIU, Diocese of San Jose, City of San Jose Office of Immigrant Affairs, and Santa Clara County Office of Immigrant Relations. Compartimos la siguiente infografía que contiene recomendaciones generales para elaborar un plan en caso de que alguno de los miembros de la familia regrese a México. Recuerde que si tiene dudas respecto a cómo estar preparado o necesita más información, puede acudir al Centro de Defensoría del Consulado General de México en San José o llamar al Centro de Información y Atención a Mexicanos (CIAM) al 1 (855) 463 6395, que opera las 24 horas todos los días del año. What to Know About Immigration Raids March 2017 comprehensive booklet that compiles information and resources that should help you respond if ICE conducts raids in your community, including a documents check list, multi-language Know Your Rights (English, Spanish and Arabic), preparing a family plan, Plan for Children's care, legal forms, contact information and more. The San Jose City Office of Immigrant Affairs, in collaboration with the Silicon Valley Community Foundation, maintains an SMS text system to provide fast and accurate Santa Clara County immigration updates in English and Spanish. Text IMMIGRATION to 30644 to enroll. Textear INMIGRACION al 30644 para noticias, informacion y actualizations en Espanol.